The Walrus was initially developed as a private venture in response to a 1929 Royal Australian Air Force (RAAF) requirement for an aircraft to be catapult-launched from cruisers, and was originally called the Seagull V, although it only resembled the earlier Supermarine Seagull III in general layout. Construction was started in 1930 but owing to Supermarine's other commitments it was not completed until 1933. The single-step hull was constructed from aluminum alloy, with stainless-steel forgings for the catapult spools and mountings. Metal construction was used because experience had shown that wooden structures deteriorated rapidly under tropical conditions. The wings, which were slightly swept back, had stainless–steel spars and wooden ribs and were covered in fabric. The lower wings were set in the shoulder position with a stabilizing float mounted under each one. The horizontal tail-surfaces were positioned high on the tail-fin and braced on either side by N struts. The wings could be folded on ship, giving a stowage width of 17 feet 6 inches. The single 620 hp Pegasus II M2 radial engine was housed at the rear of a nacelle mounted on four struts above the lower wing and braced by four shorter struts to the center-section of the upper wing. This powered a four-bladed wooden propeller in pusher configuration. The engine nacelle contained the oil tank, arranged around the air intake at the front of the nacelle to act as an oil cooler, and electrical equipment and had a number of access panels for maintenance. A supplementary oil cooler was mounted on the starboard side. Fuel was carried in two tanks in the upper wings. The pusher configuration had the advantages of keeping the engine and propeller further out of the way of spray when operating on water and reducing the noise level inside the aircraft. Also, the moving propeller was safely away from any crew standing on the front deck, which would be done when picking up a mooring line. The engine was offset by three degrees to starboard, to counter any tendency of the aircraft to yaw due to unequal forces on the rudder caused by the vortex from the propeller. A solid aluminum tail wheel was enclosed within a small water-rudder, which could be coupled to the main rudder for taxiing or disengaged for takeoff and landing. Although the aircraft typically flew with one pilot, there were positions for two. The left-hand position was the main one, with the instrument panel and a fixed seat, while the right-hand seat could be folded away to allow access to the nose gun-position via a crawl-way. An unusual feature was that the control column was not a fixed fitting in the usual way, but could be unplugged from either of two sockets at floor level. It became a habit for only one column to be in use; and when control was passed from the pilot to co-pilot or vice versa, the control column would simply be unplugged and handed over. Behind the cockpit, there was a small cabin with work stations for the navigator and radio operator. Armament usually consisted of two .303 in. Vickers K machine guns, one in each of the open positions in the nose and rear fuselage; with provision for carrying bombs or depth charges mounted beneath the lower wings. Like other flying boats, the Walrus carried marine equipment for use on the water, including an anchor, towing and mooring cables, drogues and a boat-hook. The RAAF ordered 24 examples of the Seagull V in 1933, these being delivered from 1935. These aircraft differed from the prototype and the aircraft flown by the RAF in having Handley-Page slots fitted to the upper wings. This was followed by the first order for 12 aircraft from the RAF, placed in May 1935 with the first production aircraft, serial number K5772, flying on 16 March 1936. 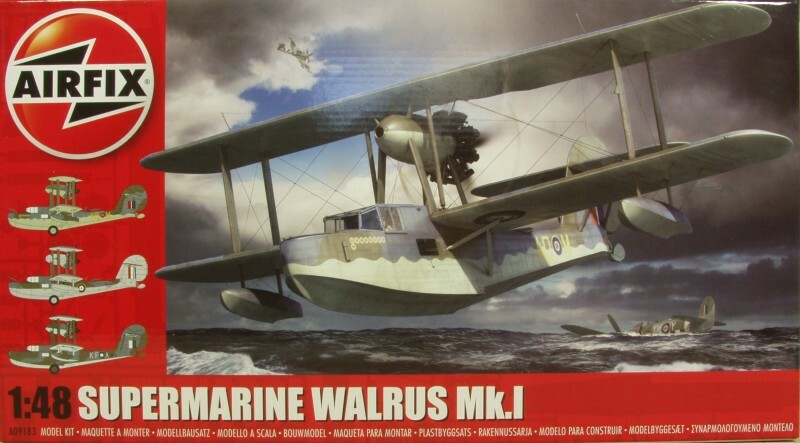 In RAF service the type was named the Walrus. Initial production aircraft were powered by the Pegasus II M2: from 1937 the 750 hp Pegasus VI was fitted. A total of 740 Walruses were built in three major variants: the Seagull V, Walrus I, and the Walrus II. The Mark IIs were all constructed by Saunders-Roe and the prototype first flew in May 1940. This aircraft had a wooden hull, which was heavier but had the advantage of using less of the precious wartime stockpiles of light metal alloys. Saunders-Roe would go on to build under license 270 metal Mark Is and 191 wooden-hulled Mark IIs. 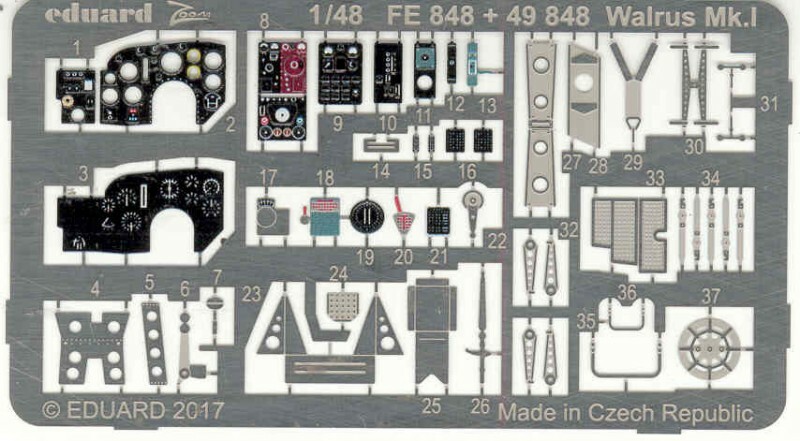 The Airfix kit comes in a moderately large, for the scale, top open tray type box and is sufficiently sturdy being made from heavy card stock, both the top and bottom halves. Like many of the new Airfix releases the box features nice artwork on the box top. 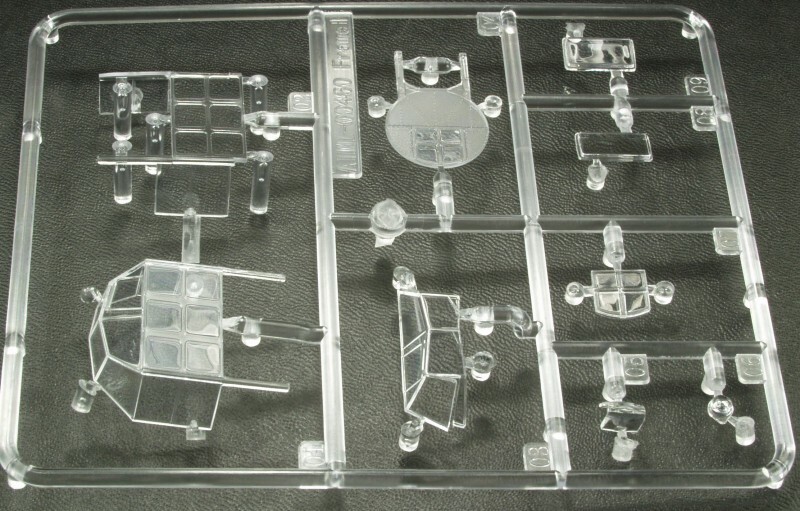 Inside the box all of the parts except the clear sprue are contained in a large plastic bag. Not always the best method, especially since in this case there is some extra room inside the box but most everything in my kit seemed to be no worse for the wear. The only damage found was the very thin support for the gunners seat was broken. 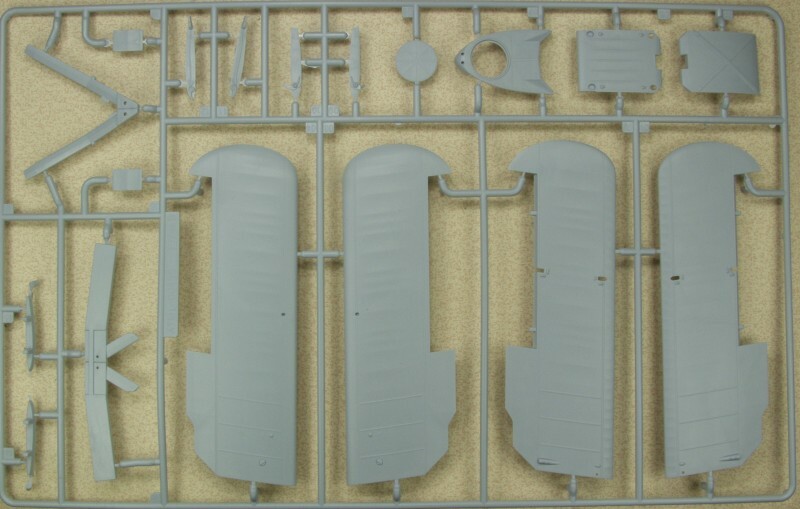 The kit is molded in the Airfix light blue color and features nice recessed panel lines and rivets on the fuselage sides. The hull bottom features both recessed and raised rivets. The surface has a matte finish to it as if the molds were not highly polished. The fabric effects on the balance of the air frame are nice and subtle. Mold alignment seams were a little more pronounced than I would have liked on some parts and what little flash I found was light and should be easy to clean up. Ejector pin marks abound especially on the interior of the fuselage. Many of these won't be seen so that will cut down the work load cleaning them up. I also found some on one side of the interior bulkheads, whether these will be seen well enough to require clean up will be the builders choice. Other than the ejector pin marks I did not find any surface defects other than some flow marks in the plastic and in most case these will not be seen once painted. 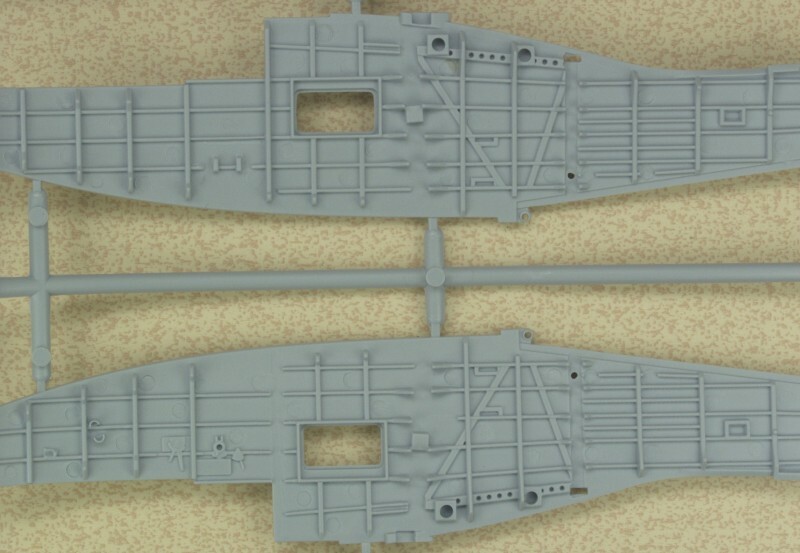 The sprue shown below has the fuselage (hull) halves and bottom and the wing flaps for both the open and folded wing options and the tops of the wing floats. A close up shot showing the surface detail. And one showing the interior surface detail. 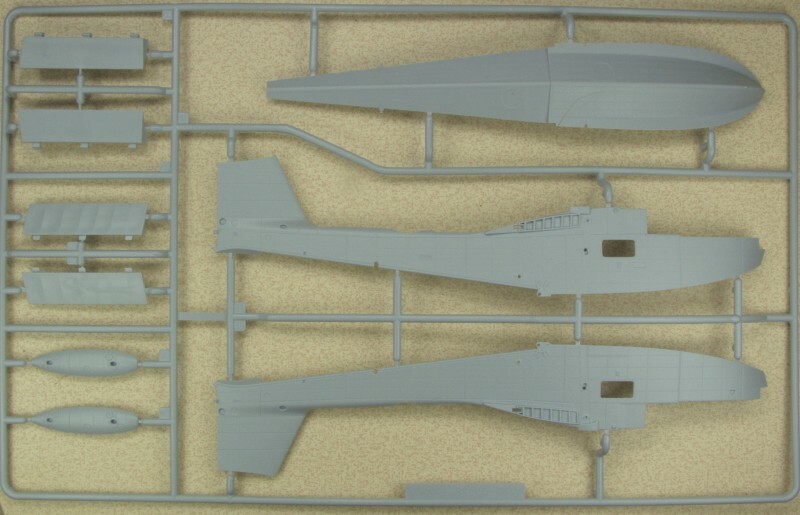 Primary parts on the next sprue are the upper wings, control surfaces are separate so they can be posed as desired. Also on this sprue are the upper wing center section and the spars for both open and folded wing options. The wing center section parts need some minor cutting on them depending on the open or folded choice. 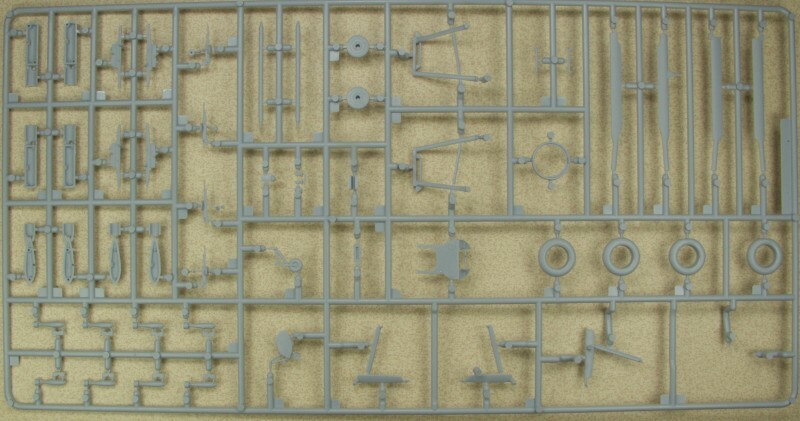 The next sprue has a variety of parts on it including under wing bombs and racks, tail wheel, guns, wing struts, landing gear parts and wheels. The tires are supplied both weighted and unweighted to provide for gear down or up options. The hubs are separate making painting easy and the tires are one piece moldings so no seam to deal with. Both a solid tail wheel incorporated into the water rudder and a separate tail wheel only are supplied but not called out to be used, perhaps for a future variant. Next up are the lower wing halves, ailerons for both wings, the horizontal stabilizer and elevators, the hull top surface, the rudder the wing float halves and covers that are installed if the bomb racks are not used. 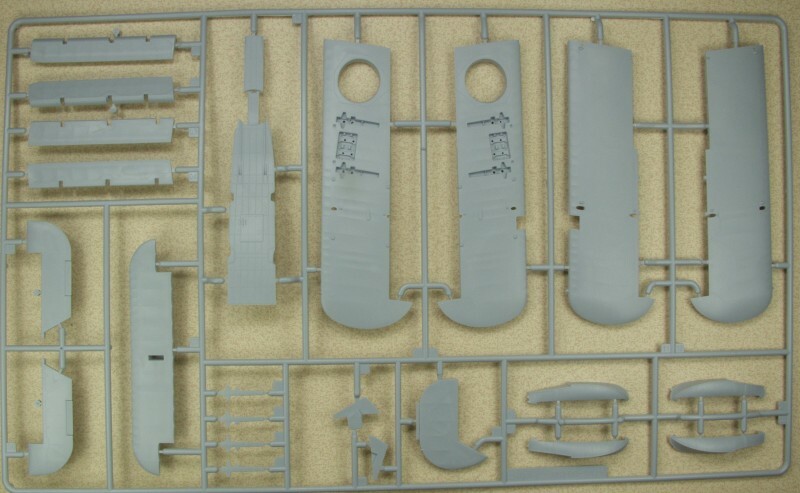 The last sprue is rather busy, it contains most of the interior detail parts such as bulkheads, floors, seats, instrument panels and various and sundry other items. Also here are all the engine parts, engine in two halves, push rods, intake and exhaust manifolds, accessory cowling, propeller blades and spinner. The interior is quite complete and should please most modelers. The instrument panel has raised surface detail with indicators molded in the instruments as well as a back panel with the instrument bodies. The clear parts are thin and quite clear with little or no optical distortion. Parts are provided for both an open and closed main canopy and an open or closed gunners station. The windscreens have wiper blades molded on them which are incredibly small and will be difficult to paint. The decals have no source of origin or printer but are very nice. Thin, in register, opaque and with very little excess film except for between code letters. 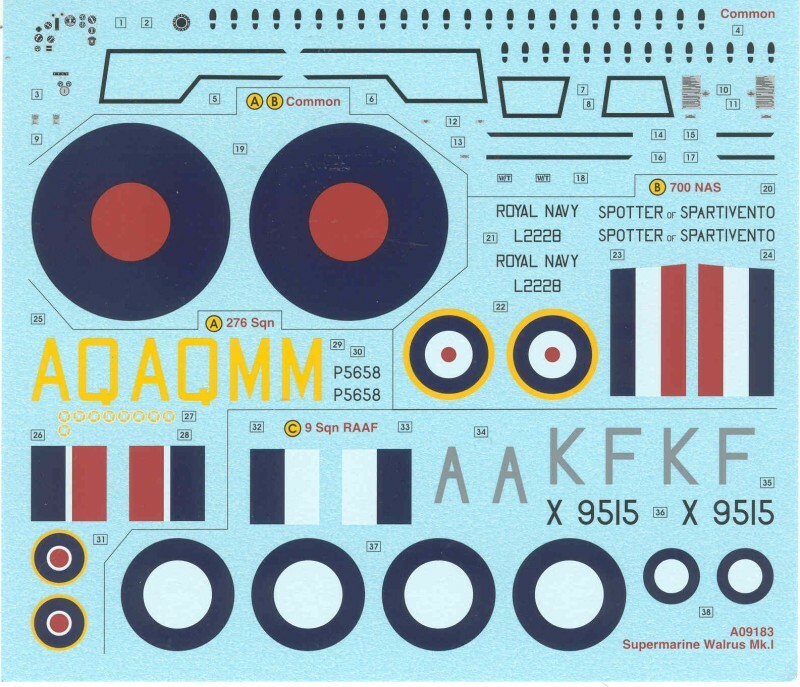 Instrument panel decals are supplied as are some data plates. Three marking options are provided. A is a Walrus from No. 276 Squadron, RAF Harrowbeer, Devon, England, 1944, in overall dark sea gray and slate gray over sky; B is Walrus from No. 700 Naval Air Squadron, HMS Sheffield, 1941, in overall extra dark sea gray and dark slate gray over camouflage gray and C is a Walrus from No. 5, RAAF, Australia and New Guinea, early 1943, overall extra dark sea gray and dark slate gray over sky blue. The marks that look like foot prints are used on two of the versions to mark the wing walkways. The instructions are pretty typical for the newer Airfix kits and is an A4 sized booklet stapled at the spine and 24 pages long. The front page has a brief history and specifications in five languages. Page two has some very basic assembly instructions in 12 languages and an assembly icon chart. assembly starts on page 3 and consists of halftone cad images in gray with parts to be added in red. There are notes throughout concerning things that must be done depending on whether you plan to fold the wings or not and gear up or gear down so one needs to pay attention. Total number of assembly steps is 105 but not all will be performed again depending on your choice of assembly options. The back page has drawings on the planes with both options. In addition to the instruction manual there are two page printed in color on both sides showing the painting and marking options for the three aircraft supplied on the decal sheet and on the back of one sheet is a rigging diagram. The instruction are quite clear and easy to read. Not needed to produce a nice model but I decided to add a Zoom photo etch set to jazz up the interior a bit. I may need to get some seat belts as well. Over all I'm quite impressed with this kit, it has a good level of detail, appears to have been well engineered and I suspect it will fit together much better than the old Classic Airframes kit. Recommended ! In box reviews can be found here, here and here.